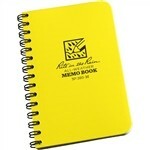 Mini Side Spiral Notebook 3 1/4" X5" ( 50 sheets - 100 pages) Journal horizontal line pattern with yellow all weather cover. A pocket-sized, 3 1/4 in x 5 in, notebook with a side spiral. The spiral memo is perfect for a variety of all-weather applications. 100 pages (50 sheets).